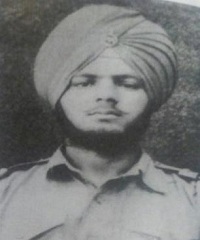 Sepoy Kewal Singh was born in the year of 1943, to Sri Sohan Singh and Smt Kartar Kaur in Kotli Than Singh village of Jallandhar district in Punjab. Sep Kewal Singh joined the Army at the age of 18 years on 20th October 1961. He was recruited into 4 Sikh of the famed Sikh Regiment, a regiment known for its valiant soldiers and numerous battle honours. By the time Sep Kewal Singh completed his initial training , the war clouds were on the horizon on the eastern border. His unit, 4 Sikh got deployed in the North-East Frontier Agency(NEFA), the present day Arunachal Pradesh to defend the Indian posts on the border. On 20 Oct 1962, Chinese People’s Liberation Army launched attacks on two fronts of India, one in Thag La in NEFA and the other in Chushukl sector of Ladakh. In the eastern theater, the Chinese overwhelmed the Indian troops in a series of flanking manoeuvres south of the McMahon Line and prompted their withdrawal from Namka Chu. With in few days the Chinese forces captured all of the territory that was under dispute at the time of the Thag La confrontation and continued to advance into the rest of NEFA. During the Indo-China war, Sep Kewal Singh’s unit, 4 Sikh was deployed to defend the Indian positions at Walong. On 22 Oct 1962, the Chinese forces attacked the Walong garrison, an Army cantonment located in present day Anjaw district of Arunachal Pradesh. Some 400 Chinese troops attacked the Indian positions but the initial Chinese assault was halted by accurate Indian mortar fire. The Chinese were then reinforced and launched a second assault. The Indians managed to hold them back for four hours, but the Chinese used weight of numbers to break through. Most Indian forces were withdrawn to established positions in Walong, while a company supported by mortars and medium machine guns remained to cover the retreat. Over the following days, there were clashes between Indian and Chinese patrols at Walong as the Chinese rushed in reinforcements. On the night of 26/27 Oct 1962, Sepoy Kewal Singh’s company was holding a defensive position on the forward defended localities of the Walong garrison. This position was threatened by enemy forces, as some of them had managed to get dangerously close to the defences. Realizing the gravity of the situation, Sep Kewal Singh in a rare display of courage, rushed out of his section post and charged the enemy soldiers with his bayonet. He killed few enemy soldiers in hand to hand fighting, but got seriously injured in the process. However, in total disregard to his injuries, Sep Kewal Singh bayoneted yet another soldier before collapsing. Sep Kewal Singh’s gallantry and dare devil action motivated his comrades to repulse the enemy attack. Sep Kewal Singh later succumbed to his injuries and was martyred. 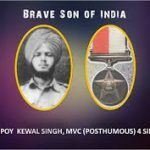 Sep Kewal Singh was given the nation’s second highest gallantry award, “Maha Vir Chakra” for his outstanding bravery, unyielding fighting spirit and supreme sacrifice. On the night of 26/27 October 1962, a Company of the Sikh Regiment was holding a defensive position on the forward defended localities of the Walong garrison in N.E.F.A. This position was threatened by enemy forces. Some of them had managed to get dangerously close to our defences. Sepoy Kewal Singh, on his own initiative rushed out of his section post and charged the enemy with his bayonet, killing a few in hand to hand fighting. In this encounter he was seriously wounded. Despite his grievous injuries he bayoneted yet another of the enemy before he succumbed to his injuries. By this act of valour and self-sacrifice. Sepoy Kewal Singh helped his comrades to repulse the enemy. 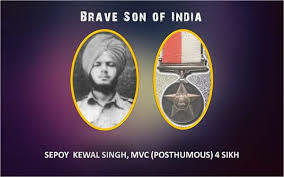 The Housing project of Kewal Vihar in Jallandhar has been named after Sepoy Kewal Singh MVC, in his honour. I feel proud,and was lucky to see the occasion and here the story of Sepoy Kewal singh s bravery was narrated at holy Sunday Diwan of Gurdwara Sikhregimental Center,by Then Stage Secy Jem Hamir Singh his parents from his village had come to get his belongings. hello, my nana ji is late shaheed kewal singh! he was a brave fighter. My nani ji told me stories about her martial relationship towards my nana ji. He was a quiet, sensitive, and humble grandfather. 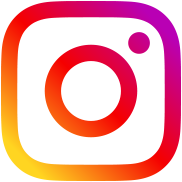 I have a channel on instagram, facebook, youtube called coreofkaur. I want to share my Nana Ji’s story and legacy! I curiously enquired if she worked for the Indian govt., she replied, “No my son, this pension is not mine but of my late husband Kewal Singh; who gave his life for his mother land in 1962 during the Indo-China war.” She told me that her husband was awarded Mahavir Chakar for his supreme sacrifice. With tears in her eyes she continued to tell that shortly after her marriage her husband returned to his duty in the army. At the time of his martyrdom she had her eight months old daughter. She described the tough times she faced and struggles she went through while raising her daughter. I had completed the application by this time and handed it back to her. I simultaneously felt honoured and emotional. Sitting in the train on my way back home, my thoughts took me to an imagined village in Punjab where through the eye of my imagination I could see the hard times she must have gone through without her husband. She is indeed a brave lady who has sacrificed her life for her daughter. Uncontrolled tears filled my eyes, it was my tribute to Shaheed Kewal Singh and salute to Bibi Surjit Kaur ji.